And always on the hunt for great new blogs. My newest favorite? I want to be her. I might stalk her, in a Single White Female kinda way. 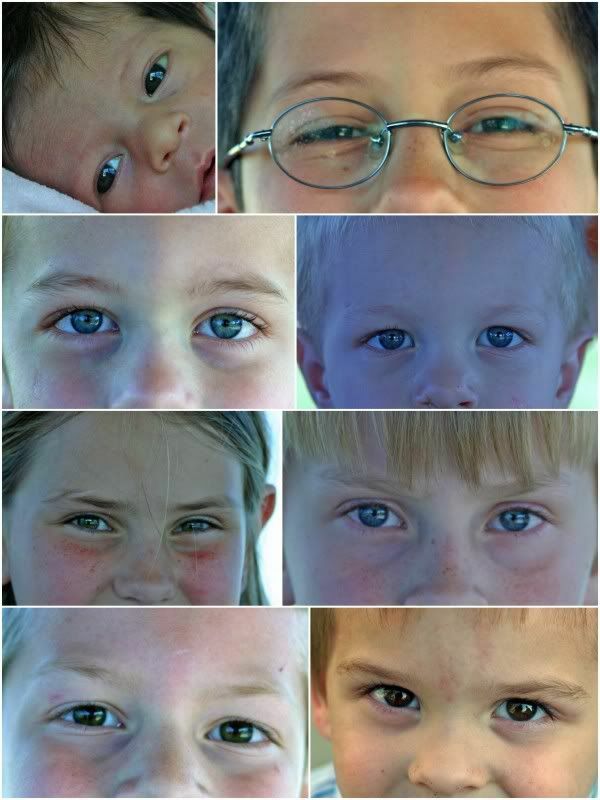 A collage of all the grandkids eyes I put together when I visited my brother recently. Some of the coloring is off, but I still like all the innocent little eyes. i was at my friend carli's site (http://theboosalisfamily.blogspot.com/) last- her & her husband have been going through heck to get their loan for their house & it was just approved yesterday, totally a God thing! i'm so excited for her! love the eyes by the way! which is about a friend of mine who is carrying a baby for a long-time friend of hers. Both blogs are well written, thoughtful, creative, and God honoring which I appreciate. Sally has a wonderful blog! I love her blog...lots of awesome recipes, as if I need to bake more, lol!! You're all listing great ones that I've never seen before! I love it! I'm excited to check all these others out. What a fun idea (I think I say that a lot on your blog)! They started their blog when they first started trying to adopt a baby. They have one son and a baby they are planning to adopt was just born this morning! it's an illness, i know. but if i ever move to nw arkansas, she and i would be best friends. she just doesn't know it! Love the collage...you are just full of great ideas! Have to go now to see who you're stalking! I stalk her. She is hilarious! What a cute blog! Thanks for sharing it! I was just visiting Simply Recipes. It's one of my favorites...she has so many yummy recipes. I was at Serene Journey's site before here. This is the blog of my good friend, Jen. She is AMAZING. Pregnant with baby #9. Talented at everything. She owns Eden's Bouquet- the most beautiful children's clothing you have ever laid your eyes on. I purchased her very first creation ever for my baby girl Anna Faith, five years ago. After I had Baby Elizabeth four years ago, she honored her by naming a collection after her. Let her I sent you Beki! I flew in from V & Co. I enjoyed perusing your blog as well as your shop! Really like the eyes pictures!! ummmm, blog? What's a blog? I went to her site and commented! You are awesome Beki! more blogs for me to stalk. You mean you read other blogs besides mine? You! You! Blog hussie! I was at Kate's blog before I stopped by here. Love the collage! Oh yea, V & Co. is one of my faves as well. She's amazing! Of course I love Meg Duerksen (who doesn't!) and Julie @ Joy's Hope. Anna Maria Horner's blog is totally inspiring, and have you ever checked out http://katiedid.squarespace.com/? I was reading my friend Christine's blog. She wsa a few years behind me in college. Christine is a preacher's wife and blogs about her family, Christ, life, and whatever topic she comes up with. They've adopted kids with RAD issues. It makes for awesome reading but isn't for everyone. was the blog I was in before. Usually on my lunch break, at my desk I go through my "dashboard" of all my favorite bloggers and check out their new posts. Typically my lunch hour isn't long enough because there are so many GREAT blogs out there. Love the photos of the children! Very nice! Have you met Beckie at Infarrantly Creative? AND she is from Kansas too! A personal blog, http://donaldandlisasorensonfamily.blogspot.com/ . If you read through a bit, you'll read about an amazing little girl and her family. Holy cow, I just had a Famousosity Moment when I was scrolling through your comments and MY BLOG was listed. These ladies are my peeps and homies and erm, friendly types.